Several months ago, Jess visited the Filling Station at Chelsea Market and picked up a jar of Black Truffle Salt. Truffle as in the mushroom rather than the chocolate round stuff, although those a delicious too. Truffle seasoning is awesome on almost anything. We took our first trip to Fairway Brooklyn in Red Hook – right where the Ikea is. They have a huge selection of items and a fresh selection of seafood. It’s a legitimate grocery store – something that’s hard to find around these parts. You can say that Fairway is like a Whole Foods and a regular grocery store combined – good and fresh selection of items but affordable. Lightly season a the fresh jumbo shrimp with black truffle salt and black pepper. Adjust to tastes. Skewer shrimp with soaked skewers. 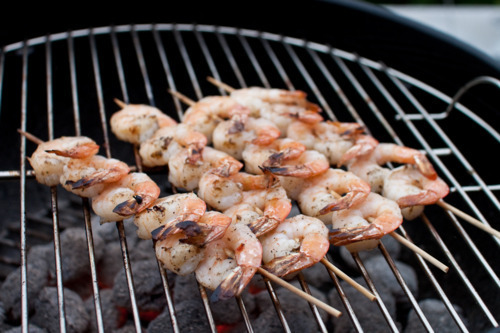 On medium-high heat, place skewered shrimp directly on the grill. Grill each side for about 7 minutes each. Use high heat if you like extra char. Turn the shrimp when the tails turn red orange.